Sailors man the rails around Anzac‍ '​s 5-inch 54 calibre Mark 45 gun. HMAS Anzac (FFH 150) is the lead ship of the Anzac class frigates in use with the Royal Australian Navy (RAN) and the Royal New Zealand Navy (RNZN). Prime Minister Tony Abbott announced major investments in Australia’s shipbuilding industry. Yesterday, the Australian government announced plans to invest more than A$89 billion (US$65 billion) in the country’s naval shipbuilding industry and to bring forward two surface warfare ship programs — the SEA 5000 Future Frigate acquisition project and the SEA 1180 Offshore Patrol Vessel program, AFP reports. The competitive evaluation program for the Future Frigate program will begin this October, with construction of the first vessel beginning in 2020 — three years earlier than expected. The Royal Australian Navy (RAN) will begin phasing out its fleet of eight Anzac-class frigates from 2024 onwards. 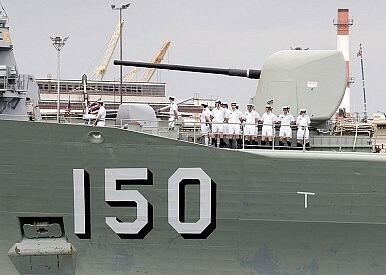 The last Anzac-class vessel was commissioned only 11 years ago, in 2006. Total program costs for the construction of eight new 7,000-ton multi-purpose frigates for the RAN are estimated to be around A$10-11 billion (roughly $7-8 billion). “Contenders for the program are understood to include the FREMM Frigate and BAE Systems’ Type 26 Global Combat Ship,” IHS Jane’s Defense Weekly states. The SEA 1180 Offshore Patrol Vessel acquisition project will be brought forward by two years, with construction estimated to begin in 2018 after the conclusion of a competitive evaluation program. The 20 new 2,000-ton patrol vessels are expected to replace 26 smaller classes of vessels that include the Armidale-class, the Huon-class, the Leeuwin-class and Paluma-class of warships. Like the new frigates, the patrol boats are expected to be multi-purpose warships that will be equipped with a modular mission payload system to accommodate various mission sets. Total program costs are estimated between A$7 and 8 billion ($5.1-5.8 billion). “The subordinate yard may be in South Australia; it may be somewhere else. It may be at Williamstown [in Victoria], for instance, but the major focus for surface ship-building will be here in Adelaide,” he added. Abbott’s “continuous shipbuilding” proposal came after criticism by defense experts that Australia would likely face a shortage of warships over the next 20 years without steps to accelerate naval construction and consequently also avoid downsizing the skilled workforce at ship yards. Abbott refused to reveal any details over the ongoing and controversial competitive bidding process for a $39 billion contract to build Australia’s new submarine fleet in partnership with Australian industry.